I've been working for a while on a valve to control the flow of the polymer from the extruder. The design above owes a lot to both Ed and Ian, and works reasonably well (though it leaks a little slowly at the side, as you can see). 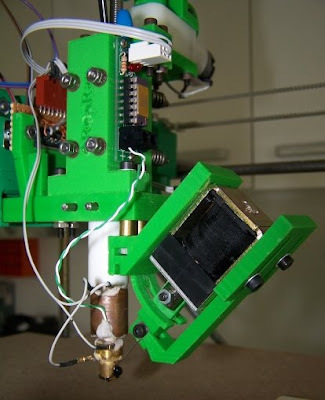 I've documented it on the Extruder Improvements and Alternatives page here. It consists of a latching solenoid that pushes a piece of stiff piano wire across the exit to the nozzle, blocking it. This doesn't completely stop the flow, but it does eliminate a lot of leakage. It also allows tricks like starting up the extrude drive motor with the valve closed, building up a little pressure, then opening the valve to ensure a clean sharp start to polymer deposition. Controls for all that sort of thing are available in the RepRap Java software and in the Arduino (and PIC) controllers. The big problem that this design overcomes, and the reason that it is a little complicated, is that of getting the nozzle and the wire holes to cross exactly in alignment in the middle of the device. It's quite easy to get them to cross at the exit (one just drills the 45o hole using the nozzle flow hole as a centre), but that leaks - the crossing point has to be in the middle. The nozzle is rather longer than the standard no-valve one, and so it can get a little cold at the tip as all the heat has to be conducted down to it from the heater coil round the main barrel of the extruder. For the extruder using this new valve, I took an extra 2-ohm length of fibreglass-insulated nichrome heater wire, crimped a couple of connectors on the end, cut a short length of brass tube, and set the lot in more fire cement round the top of the valve nozzle. With a 6 ohm main heater in series, this puts 25% of the heat directly into the nozzle, keeping it nice and cosy. I'd have thought that using a direct drive shaft and trying to back off the filament would have been simpler. This looks hellishly complicated, especially the bit where the music wire goes in. It seemed like the last music wire blocked nozzle that you made was a lot simpler. Was something wrong with that one that you did it this way? Could you use a wire with a larger diameter and just drill across a plain nozzle? The increase in diameter being enough to cope with the inevitable misalignment to the nozzle hole. Using a simple Vee jig with a guide hole aligned by the Vee can be pretty accurate. Forrest: the previous one leaked, as it says. The problem is getting the crossing point in the middle of the flow. I've found a way of effectively blocking the nozzle from within the extruder, with a V shape ended pin, which self-aligns to the nozzle hole, and with NO extra-holes (so, with zero oozing and with zero leaking elsewhere) - my problem now is that I need the code for controlling an extra controller (either motor or solenoid) to actuate the lever of this mechanism. I'm currently on a K2800, which works with Repetier Host, but I also installed the external/independent controller unit, which runs Marlin.